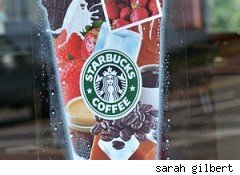 Same-store sales were the big story in Wednesday's fiscal third quarter earnings report, and Starbucks (SBUX) delivered the iced frappuccinos, serving up a 9% increase over the third quarter 2009, a 6% increase in traffic and a 3% increase in average ticket. Analysts expected a 21% rise in net earnings, to 29 cents a share, and they got exactly what they were anticipating, including revenues of $2.61 billion and non-GAAP operating income of $348.1 million. Investors, perhaps, hoped for more than the analysts did; the stock bounced down between 2% and 3% as the closing bell approached, finishing the day at $25.17, down 60 cents, or 2.33%. And even despite the company's announcement simultaneous with the earnings report; that it would increase its cash dividend 30%, from $0.10 per share to $0.13; in after-hours trading, prices were down significantly, nearly a dollar, or 3.66% further, as of this writing. Chairman, CEO and President Howard Schultz noted the launch of its instant coffee product, VIA, in the grocery channel, and trumpeted the achievement of posting "the highest levels of customer satisfaction in Starbucks history and despite the challenging global economic environment." CFO and Executive Vice President Troy Alstead described "the continued strength of our business, as evidenced by record third-quarter earnings and the resulting strong cash flow." Investors were, perhaps, looking at a different interpretation of the grounds at the bottom of their coffee cup.